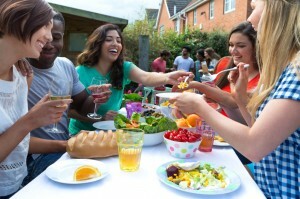 Meat, chips and ice cream sandwiches always characterize summer barbecues, but all of that food can make you feel groggy in the hot sun. 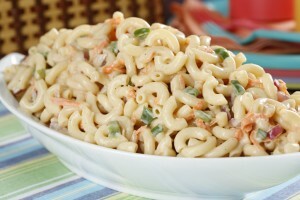 Freshen up your BBQ offerings with a delicious pasta salad that lets you incorporate some unique flavors (as well as some vegetables) into your meal. 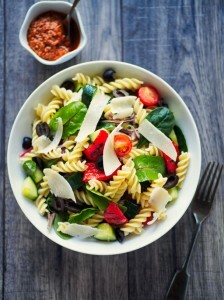 Here are a few pasta salads you should make sure you try. Bring a large pot of water to a boil. Add the salt, stir, then add in the pasta. Boil, stirring occasionally, for 10-11 minutes, or until al dente. 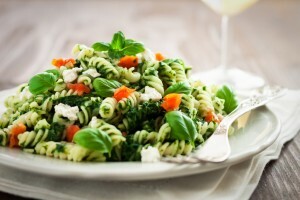 Drain in a colander and run the pasta under cold water for a few minutes. Cut the veggies. In a medium-sized mixing bowl whisk together the olive oil, red wine vinegar, dijon mustard, Italian seasoning, minced garlic, lemon zest, salt, and pepper. Once the pasta has cooled, transfer it to a large serving bowl. Add in the chopped vegetables and half of the dressing. Stir until everything is well mixed, and add more dressing as needed. Serve at once or refrigerate until ready to eat (can be made up to 24 hours ahead of time). Cook macaroni according to package directions. Drain the noodles, rinse in cold water and drain again. In a large bowl, combine mayo, BBQ sauce, seasonings, hot sauce and vinegar. Add the drained noodles and chopped veggies and cheese. Stir to combine and refrigerate before serving. Add the tomatoes, parmesan, oil, chives, 1 teaspoon salt, and 1/4 teaspoon pepper and toss to combine. Process first seven ingredients in a food processor 30 seconds or until thoroughly blended. Transfer to a bowl, and cover and chill 1 to 24 hours. Place cooled pasta in a large bowl. 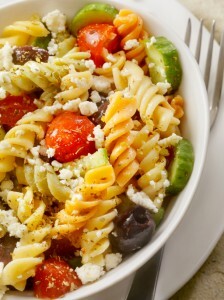 Stir in olives, cucumbers, sun-dried tomatoes, and artichoke hearts until well blended. Add yogurt mixture, and stir just until well coated. Gently stir in feta cheese. Cover and chill 1 hour. Get all of the fresh ingredients you need for the ultimate barbecue layout at a price that will make you smile at Reams! We have great weekly deals that help you eat right for half the cost!